Here at pocketnannies we love books. Whether we’re reading with our little ones or indulging in a book of our own. Reading is a great way to help children escape, but also to relax. Over the next 3 posts we’ve plenty of book related content for you. Tomorrow, Thursday 3rd March 2016, is World Book Day. 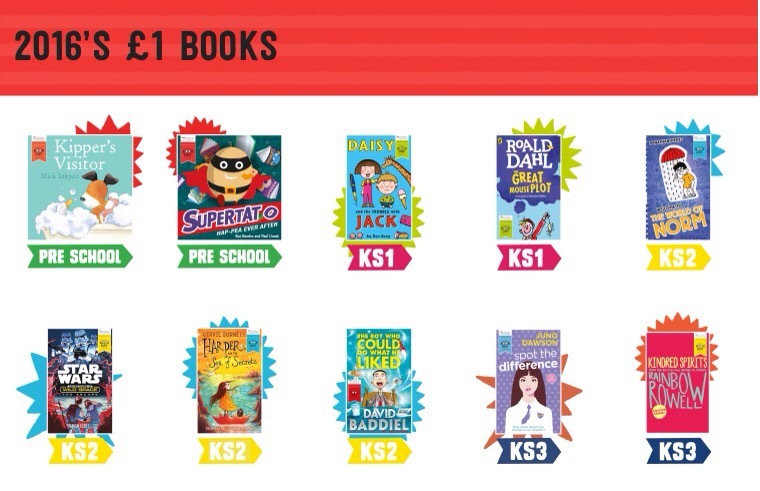 Children are given £1 book tokens which they can spend on a choice of £1 books, or use them on full priced books. The World Book Day Book Tokens are valid from Monday 29 February–Sunday 27th March 2016. What better way to get children from all walks of life reading. Schools often ask pupils to dress up, if you need a little inspiration check out this page. There are 10 books for children to choose from ranging from Pre-school, KeyEdit Stage 1 (children aged 5-7), Key Stage 2 (children aged 7-11), and Key stage 3 (children aged 11-14). There’s a title from Roald Dahl, that would be my immediate choice, as I loved Roald Dahl as a child. The Great Mouse Plot sounds like another fun book, and is illustrated by Quentin Blake as many of Dahl’s titles are. There’s also a lovely Mick Inkpen book. Kipper is a lovely gentle story for any little one. I read this one in the shop, and found it very sweet. I didn’t think it was fair to stand in Waterstones and read the Roald Dahl book however much I’d have liked to. There’s something about cosying up with a book, I do think I could live in a bookshop. There appears to be a good range of titles in the selection. I know my 6 year old will probably go for the Star Wars book.. so I’ll probably be reading that one over the next few weeks. Which would you choose? There are some great resources and you can find out more on the website. Whatever book you’re reading on World Book Day – enjoy.